Manufactured using a combination of laminated modified Accoya® and European sourced timber including European Redwood, our windows are knot-free and bonded to provide superior quality, strength, and stability that solid wood cannot come close to matching. The elements most vulnerable to the weather, such as cill extensions, are manufactured from solid Accoya®, giving outstanding durability and stability due to its water-resistant properties. 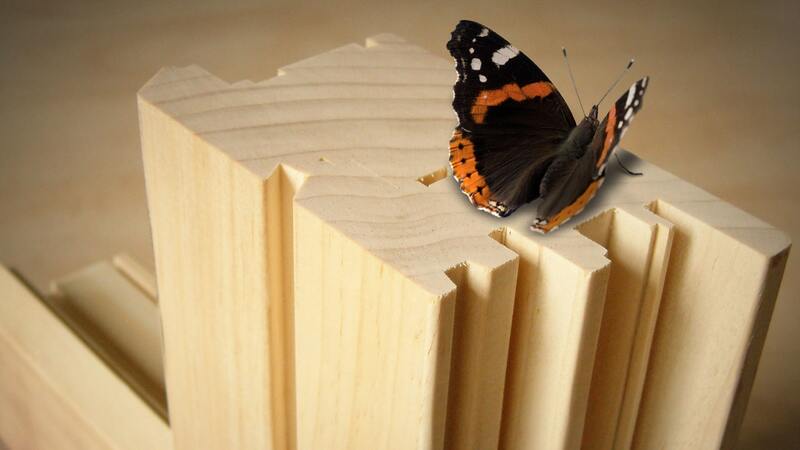 Vulnerable sections are laminated to provide excellent stability and a superior finish. Durable materials are always placed on the outer exposed layers. These premium timbers have extremely low thermal conductivity, coupled with specially formulated bonds and strong joints, this ensures the highest standard of finish. Accoya® is an engineered timber that it is dimensionally stable with a class one durability status (matching or exceeding most hardwoods). It is water resistant, virtually rot proof, doesn’t swell, shrink, twist or warp, and there is very little to no movement in the joints meaning that it not only looks better for longer but also requires less maintenance. Accoya® is also an environmentally friendly material (manufactured from sustainable pine forests), the entire ‘chemical’ process is non-toxic, the by-products are repurposed so there is no waste, and the end product, is totally recyclable. More information can be found at www.accoya.com. Used for the interior of our products, its natural tight grain gives a superior moulded and painted finish. The use of hardwood in Westbury products is minimised (less than 4%) and used only in areas where it is truly necessary – such as door thresholds where there is more human impact.